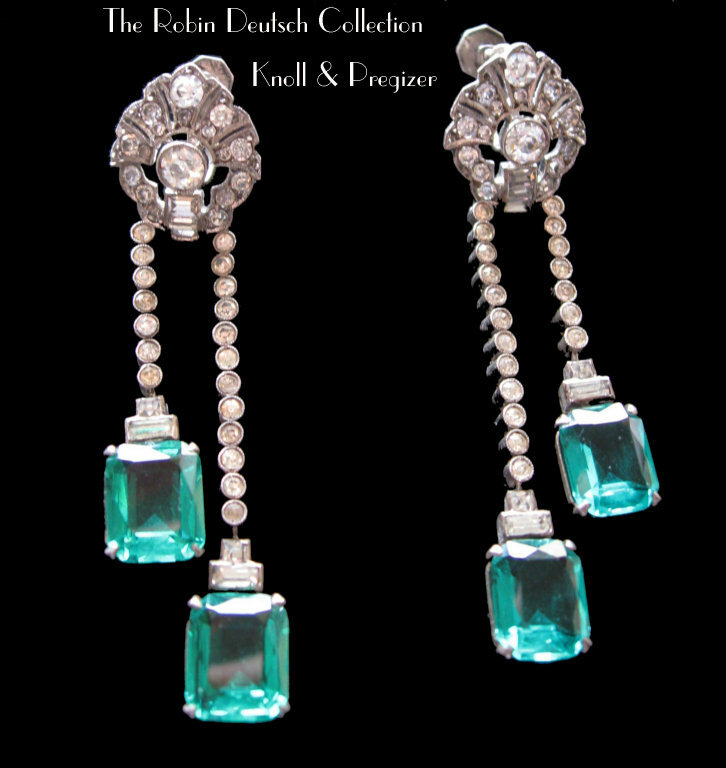 Exquisite Art Deco faux "Emerald and Diamond" paste pendant earrings. One of the finest pair of Knoll & Pregizer earrings I've ever had the pleasure of owning. Art Deco in style, the surmounts are all pierced and millegrained sterling silver with a crown of bead set pastes, a central large bezel set large round paste with 3 channel set baguette pastes underneath, terminating in a double row of sterling, asymmetrical in length, solid articulated bezels set with round paste stones with open back prong set unfoiled glass emerald cut faceted "emeralds" hanging from them, each with a bezel set baguette and square cut stone above them. The emeralds are more green in person. All of the clear stones are set in open back settings with silver foiled pastes. Each screwback is marked Sterling Germany 935 KP with a letter P. The tops are 1/2" wide and the length including the longest drop is 2 1/4" long.